I really love Christmas crafting and sewing! 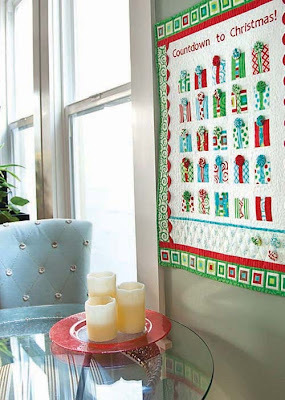 That is a super cute snowflake and I think I would definitely make the pillow, but in the colors of the quilt. Beautiful! Like my Facebook page and comment on the Day 13 post. I'll choose two more winners Friday. Happy holidays a little early and thanks for following my Modern Holiday Blog Tour! Amanda, I like you on Facebook. I rally had fun looking at all the different projects on this blog hop for your book! Thanks for sharing and thanks for the awesome give away! Good morning. I am a follower through BlogLovin and now Facebook. I am so excited for your book. I have been loving the sneak peaks on the tour. HI! LOVE YOUR BLOG+FOLLOW YOU ON FB (linda.douglas.35) AND BLOG LOVIN'! THANKS FOR A WINNING CHANCE! HAPPY DESIGNING! I lied you on FB. The book looks fabulous, loving the quilts in it! Thanks for the blog hop, it was fun. Hi Amanda. I already like you on FB. I absolutely love the projects in this book. They are beautiful. Thank you so much for the chance to win it.Fingers crossed. Amanda ~ I've previously 'liked' your Facebook page. I don't use instagram so I can't get that entry sadly. I just wanted to say thank you for the great blog hop and again, congratulations on your book. Your projects in this book are so cute! I would love to make each and every one! I am thrilled to know you are on Instagram (now following) and following on FB as well. You rock! Amanda, I liked you on FB. Love all the inspiration you've provided for my holiday sewing! I follow you on FB! Great site! I got you on FB! I just love your patterns! I wish I could sew as fast as things go on my list of 'must makes'! ;) Thanks for the chance! I clicked to follow on facebook. THanks for the chance! Love the book. Everyone has made such beautiful projects. I love the christmas theme. Awesome job. I like you on Facebook now. I thought I already did, but found out differently! I have really enjoyed your log tour and fall in love with this book more with every stop! Thanks so much!! This has been a great blog hop to follow. Thank you so much for giving us this opportunity to win your book! I liked you on facebook. Thanks for such a great book hop. Have enjoyed seeing all the beautiful projects in your book. It's on my wishlist!! I left some comment love on FB and I'm following on Instagram, which I'm very new to, hehe. I have liked you on facebook and I am following you on Goggle Friends. Thanks for the chance to win. I like you on Facebook. This has been a great blog hop. So many gorgeous projects and things that I wish I had the time to make. My favourite thing was the bear label, I love that so much. Thanks so much for hosting and organising this bloghop. Already liking you on FB. Have enjoyed seeing all the pics from your book in the blog hop. Thanks for the chance to win. I follow on FB. I have enjoyed seeing all the projects in this Book. It is a must have. Following you on Facebook I have enjoyed this blog hop. It has inspired me so much. This book is on my must have list. thanks for showing so many photos. I have been following your facebook page for quiet some time now. And of course i follow you here to via Bloglovin. What a fabulous book. Crossing my fingers & toes for the chance to win. I do not use instagram. Thank you for hosting the book giveaway. I like you on FB. Love the look of the new book. They cover tree quilt is gorgeous. I've missed a couple of days of the blog tour, but have certainly enjoyed the days I didn't miss. I'm looking forward to seeing your book. Christmas is one of my favorite holidays and quilting projects add to the festivity. All the projects in your new book are so inspirational! I just love your designs and can't wait to make lots of these wonderful goodies to give as gifts and decorate my home! Thank you for all the great projects!! I'm a follower and I liked your post on FB and commented. I don't do Instagram ... guess I'll have to try that soon! Thanks for the early holiday inspiration - and the chance to win your great new book !! I signed up to follow you on Facebook. I've enjoyed your blog tour! What a fabulous book/blog tour! I love your new book! thank you! I like you on Facebook and have enjoyed receiving your e-mails. Good luck with the sale of your book. I already follow you by e-mail, but I liked your facebook page. Thank you for sharing your book with all of us. I love all the samples everyone made. I already like your FB page! Great book- like your FB. Amanda, I LIKE your Facebook page! !